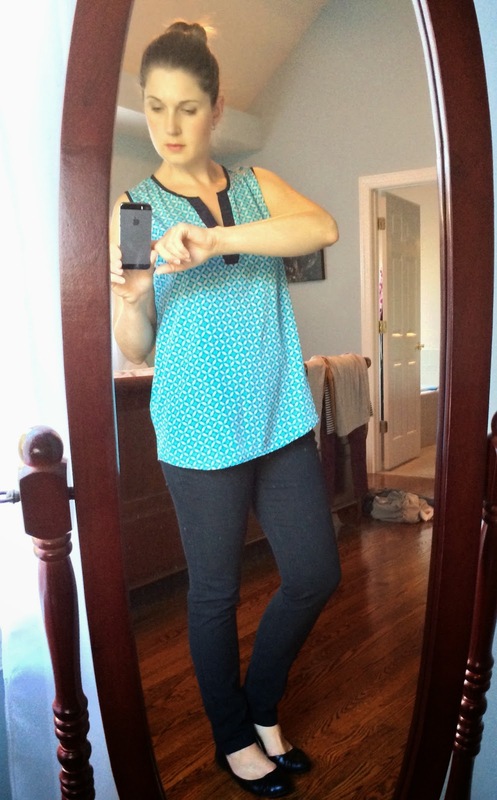 Have you heard me talking lately about Stitch Fix? I bet you have! I absolutely love it! It's my new favorite mail order service. 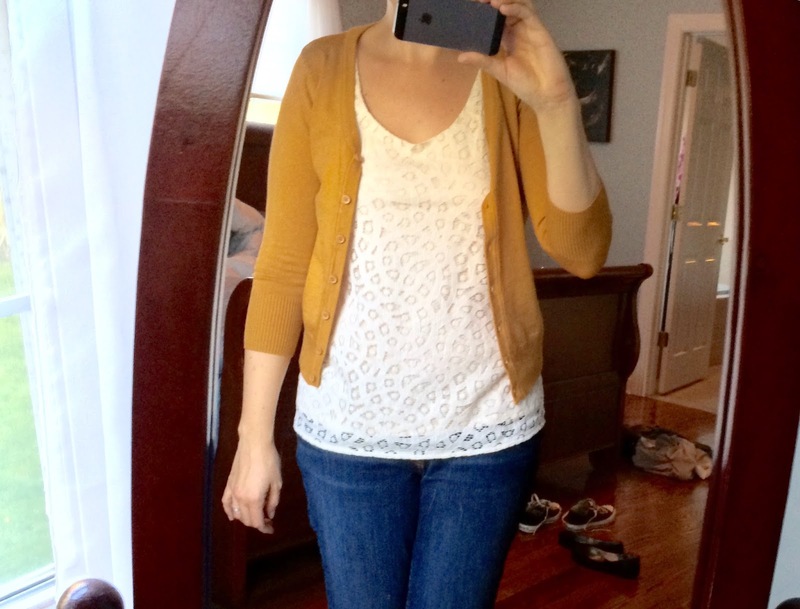 How does Stitch Fix work? You sign up on their website and fill out a questionaire. It asks you about your fashion likes and dislikes, fitting, size, etc. You want to be as truthful and detailed in your answers as you can possibly be. That will set up your style profile. You are charged a $20 styling fee every month for each Fix that you get. Then a stylist will select 5 items for you, and you will get them in the mail. Once you receive the items, you have three days to test them out. I like to try each piece on first for fit. If it fits well, then I start to combine it with other pieces I have in my closet. It's fun putting together the outfits. 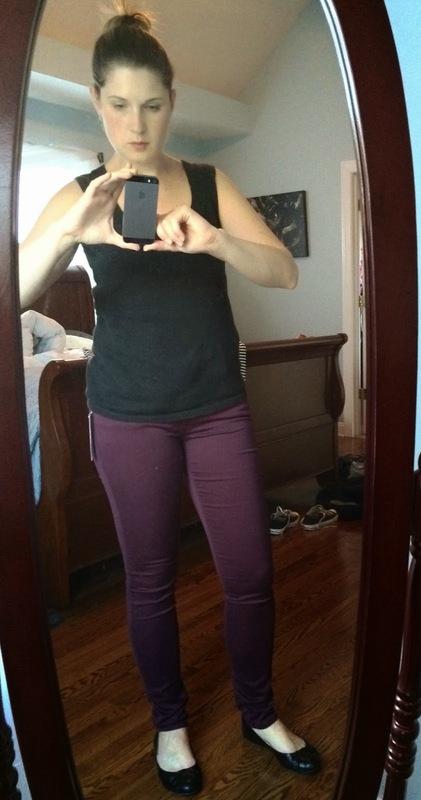 I try the items on for the hubby and even have him snap some pics to send to my mom for her opinion. Now the fun begins...when you receive your fix you get to try on all of the clothes from the comfort of your own home. You can pair them up with items already in your wardrobe, shoes and accessories. It's so much fun and it really tells you if you will get a lot of use out of an item or not. Once you have decided what you will keep, you go back onto their website and check out the items you will buy. The $20 styling fee is deducted from your purchase. If you order all 5 pieces, you will get 25% off your entire order + the $20 deduction. Also - and this is the most important thing - leave feedback on every piece! I leave feedback - good and bad - for everything. How else will your stylist know what you like and do not like? Any items that you are not keeping, you return in the prepaid envelope within 3 days of receipt. Ok, by now you must be saying to yourself, "Why is this girl babbling on? Just show us what you got already!". Well, here we go! 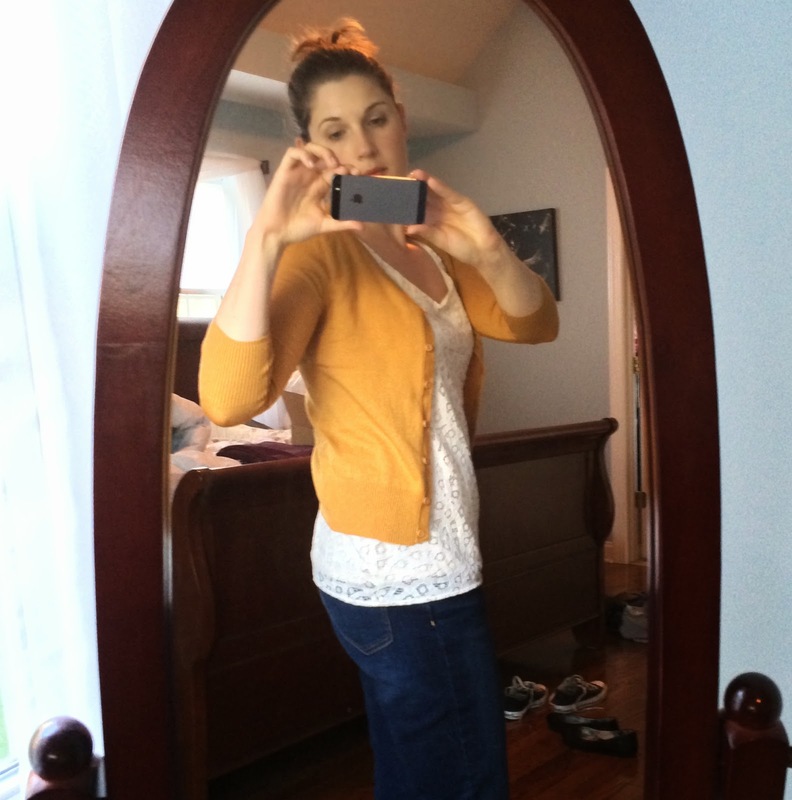 I have a hard time finding jeans that I really feel comfortable in. This pair just fit so well! The length is great and the rise is perfect. I love the cuff at the bottom. They are distressed but not overly so. I also really like the rinse color. Rockin' it or Droppin' it? - Totally Rockin' It! Next time I'll have to get my hubby to help with with taking the pictures. 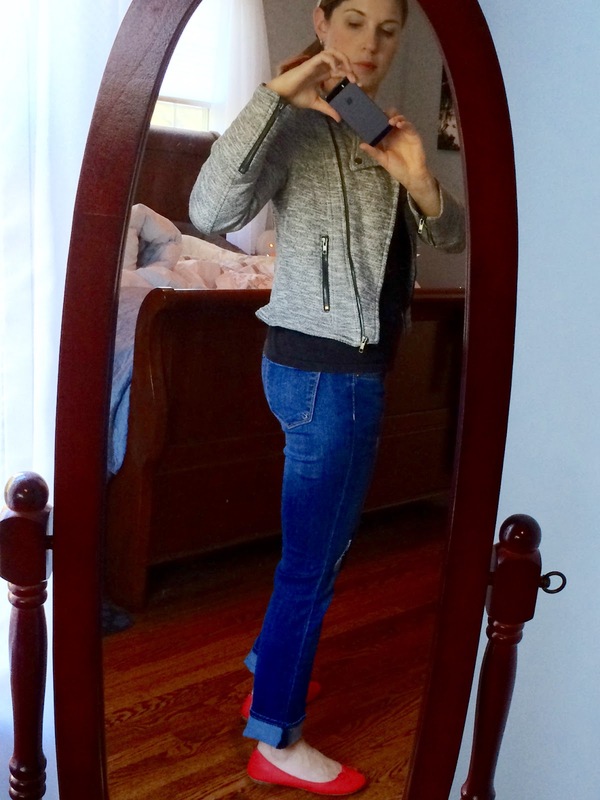 It was difficult to get a good "selfie" of this jacket. This jacket was a very flattering cut. 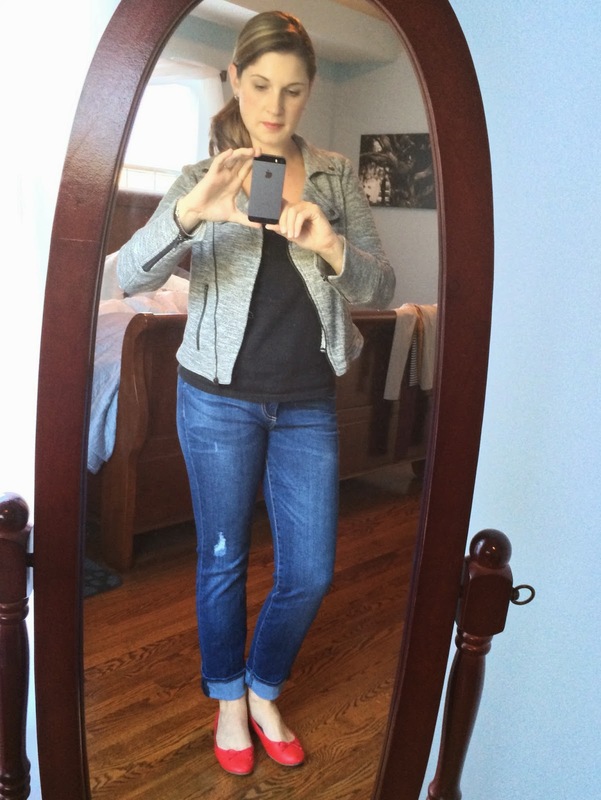 The fabric is a soft knit and I loved it paired with the boyfriend jeans from the fix. 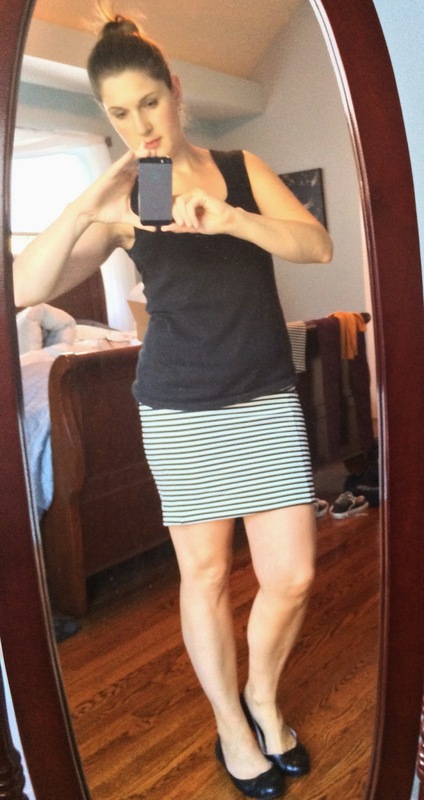 I also tried it on with a little black jersey knit dress and it looked really nice. 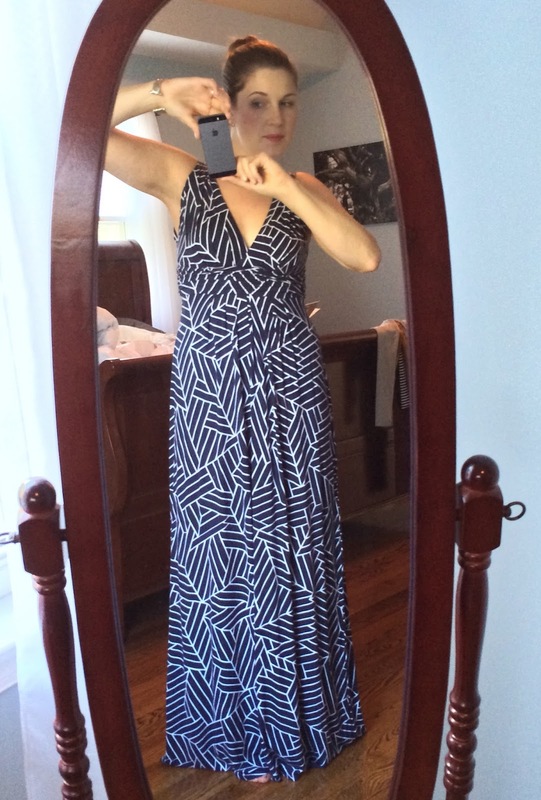 I received this dress in my September fix because I had added a maxi dress onto my Pintrest board. At $128, I was really torn over keeping the dress. I absolutely loved the style, fit, color, print - everything! But considering that the cold weather is coming and the price, I wasn't sure how much use I would get out of this piece. In the end, my mother convinced me to keep it (she's an enabler for sure). I ended up wearing it to my cousin's rehearsal dinner and I've got a trip to San Diego coming up so I'm sure I'll get a ton of use out of it on that trip too. This top was cute and comfortable. I like it paired with these black skinnies but also think it will look cute with jeans or a pencil skirt. Here's a close up of the pattern. Rockin' it or Droppin' it? - Rockin' It! Let me start off by saying I have no idea what is going on with the camera angle in this picture. The bracelet is a cuff bracelet but it really does not look that tight on my wrist. It's a very nice, basic piece that can be worn dressy or casual. A good accessory staple. I love the faux leather accents on this tee. 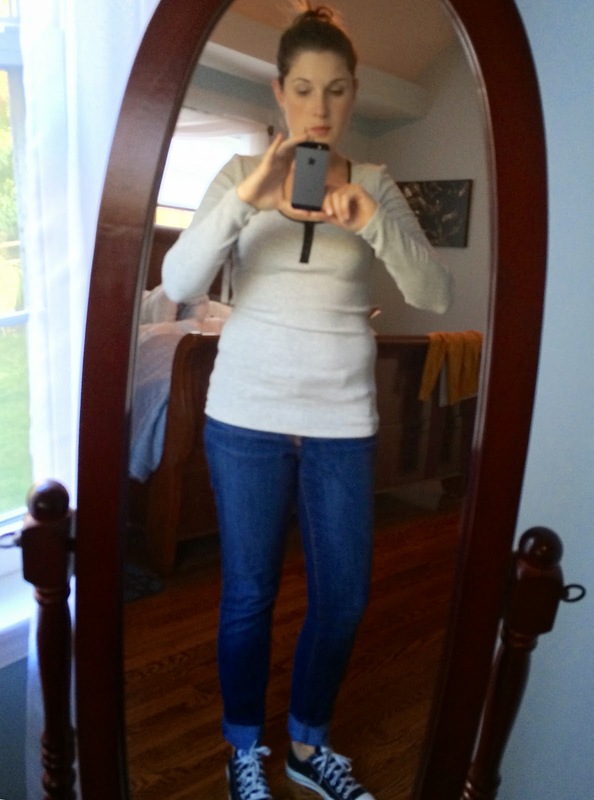 Unfortunately, the rib knit material makes it too clingy and I felt uncomfortable in the shirt. Rockin' it or Droppin' it? - Droppin' It! Too tight, too short. This would be good for someone about 10 years younger than me. Plus I already have almost the same skirt which is a little more appropirate in length. Oh, these skinnies are breakin' my heart! How I wished that they would be the perfect pair of burgundy pants that I was looking for. Sadly, I look like a sausage stuffed into these jeans. I had sent my stylist a note saying that I really wanted a gold piece in my Fix for October. I squealed with delight when I opened the box and saw this cardi wrapped up in that white tissue paper. It's super soft and such a rich color. I like that it is cropped so I can wear it with a longer cami or with a dress. The style card that came with the Fix has some great outfit ideas that I cannot wait to try. 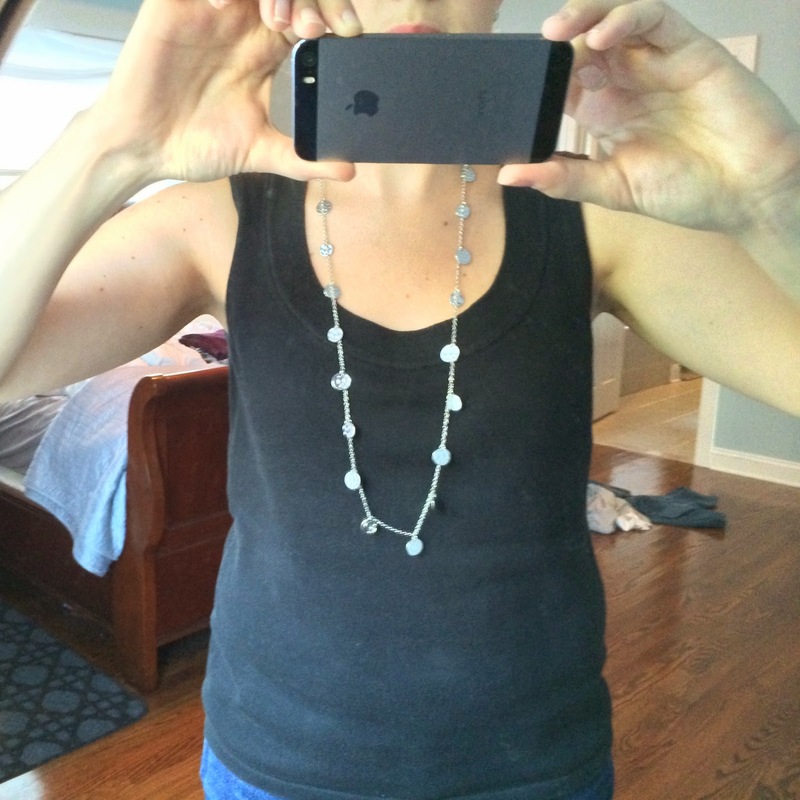 A fun accessory that can be worn with lots of outfits. I do not have a silver necklace that is this length. So that's it! As you can see, I had so much fun with these Fixes! If you want to try it out for yourself, just head on over to Stitch Fix, fill out a style profile, and soon you will have a Fix picked out for you by your own personal stylist! I got that same faux leather henley, and it was super clingy on me, too! Love your blue top & dress from Sept, though.